These little girls have been annoying each other all summer, but look at them now. Methinks Frieda is making sure her heat source, Jasmin, doesn’t escape. A lovely, rustic apartment complex is across the street from the woods, and lots of students live there. With this view from your front door, would you study, or venture out along that little path? 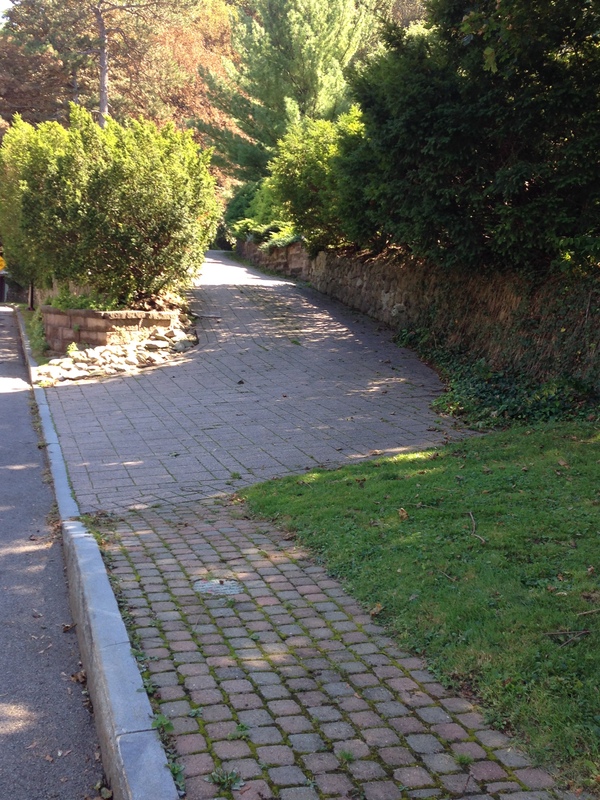 Speaking of paths, the first time I walked past this gorgeous, winding driveway I was so envious. The first time in the snow? Pure happiness for my short, straight one! And one new book, the incomparable B.B. King. 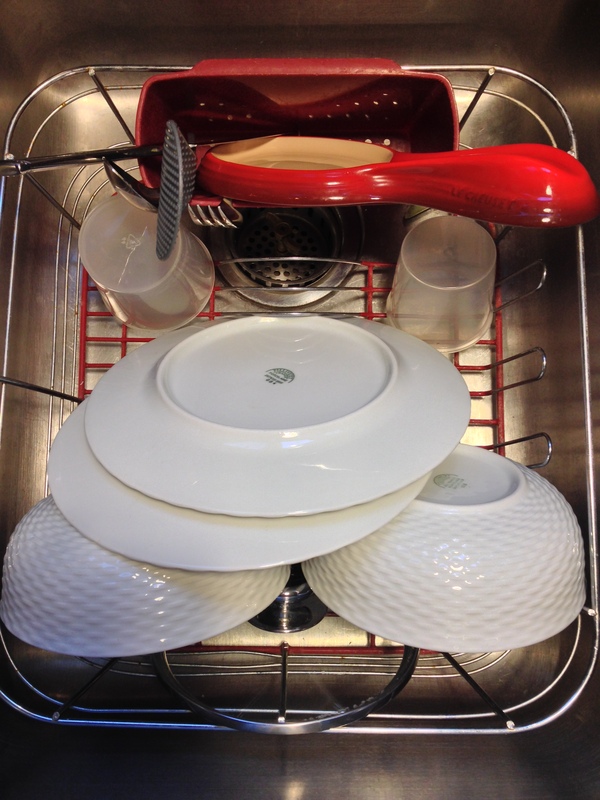 One of my pet peeves – dishes left in the sink overnight (which would be my own fault). This morning, a rather marvelous arrangement greeted me. How did I do that? Plans begin….and sometime in the spring, somewhere along the central California coastline, my daughter will be married! This entry was posted in books, cats, Sunday Sevens, Uncategorized and tagged B.B. King, threads and bobbins, Wegmans by jendavismiller. Bookmark the permalink. A lovely wedding to look forward too, wonderful. 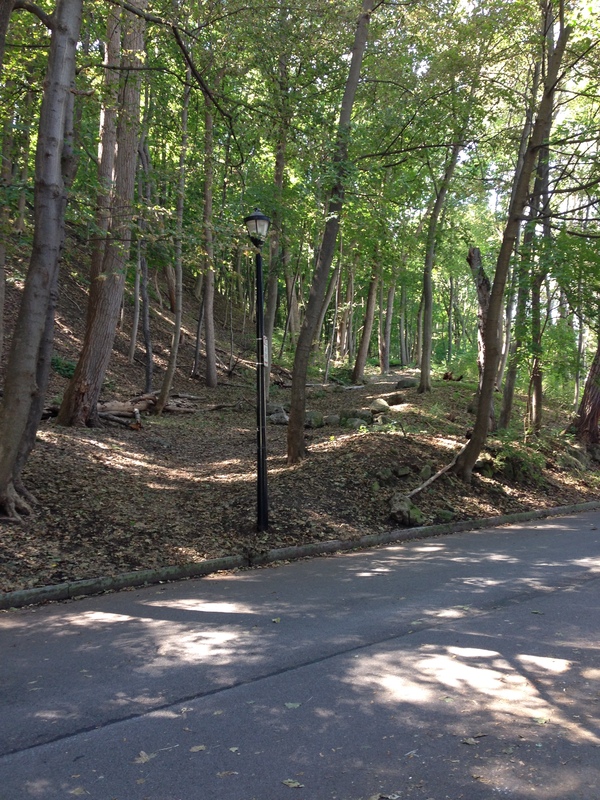 The path through the woods looks enticing, if a student I would find somewhere down there to study. I revised for some exams by the River Cam wonderful. The wedding will be here before we know it! Very exciting times. I had to look up the River Cam — what a marvelous place to study (and anything else)! Such lovely pictures! I would love to take that little path into the woods–so beautiful. Thanks, the woods are wonderful indeed. Not too deep, but you can ramble around in them for hours. Congratulations to your daughter. How exciting. Beautiful pictures of autumn’s arrival. Thank you! Her colors are (at this moment) gray and purple, won’t that be pretty on the beach? Autumn is always my favorite season, so brisk and colorful! That last image is stunning! Congratulations to your daughter….wedding planning is such fun. You’ll need a dress of course…will you make it yourself? 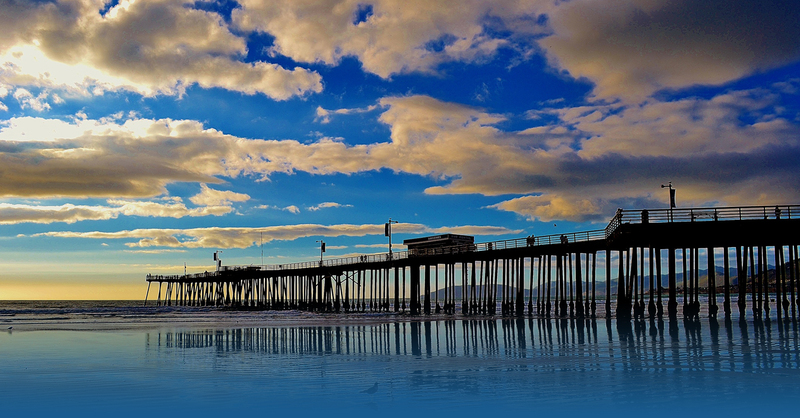 The pier is on Pismo Beach – one of my favorite spots. Seeing pictures from the area make me miss California (not to mention that my family is there!). Oh, that fabulous photo was snagged from the PB website, I forgot to cite it. Her colors will probably be gray and purple, which shouldn’t be difficult to find. I am hoping to make it myself, but oooh, I have to hone my skills in the meantime. I’ll be seeing her in a few weeks, can’t wait to see how the plans are progressing. 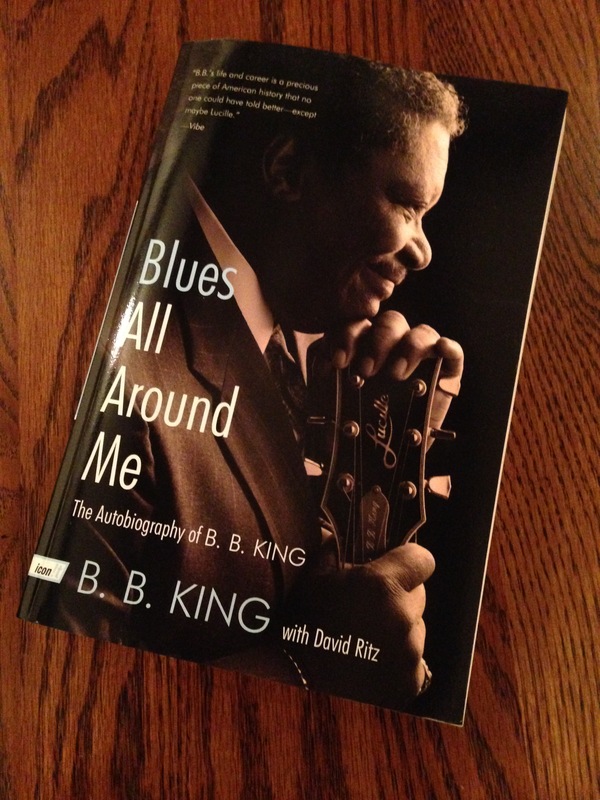 Thank you for mentioning the BB King book – love him so much! So happy to include his biography (haven’t read yet) wasn’t he a treasure! Glad to meet another BB fan. 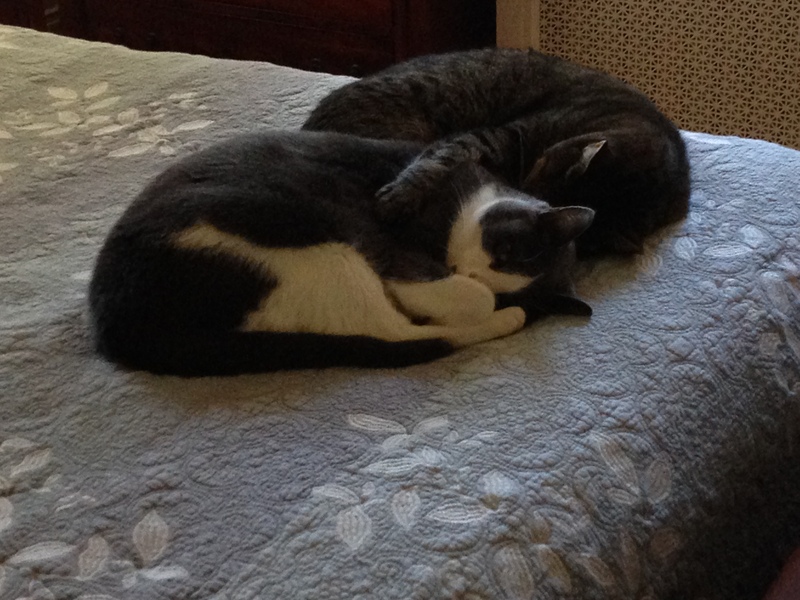 It does make me smile when pets cuddle up together – very sweet! 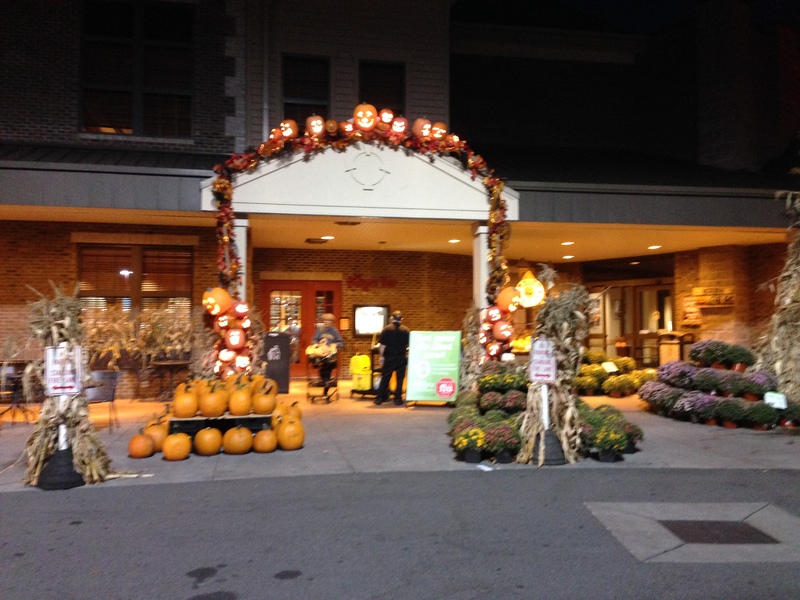 I can’t wait for the pumpkin display outside our local fresh market; they had HUGE ones last year! I’m not a fan of pumpkin spiced stuff though – only like them to look at & carve! It will be great to get wedding updates; I bet you are very excited! Oh, I love pumpkin spice! In pumpkin pie….and maybe one pumpkin bagel (ok, maybe 2) during the season. But I must draw the line at pumpkin drinks! You’ll certainly have wedding updates (will try not to bore you with too many). It’s a very exciting time indeed! Another lovely set of images Jen, especially the amazing one at the end. Also I found the sink picture strangely compelling – the symmetry, colour and composition. Weddings are just the best. I do hope you share more about it with us, especially the clothes!